Microsoft SMS Organizer Probably The Best SMS App In Google Play Store With A Lot Of Features. These Newly Added Features Make It More Useful App. 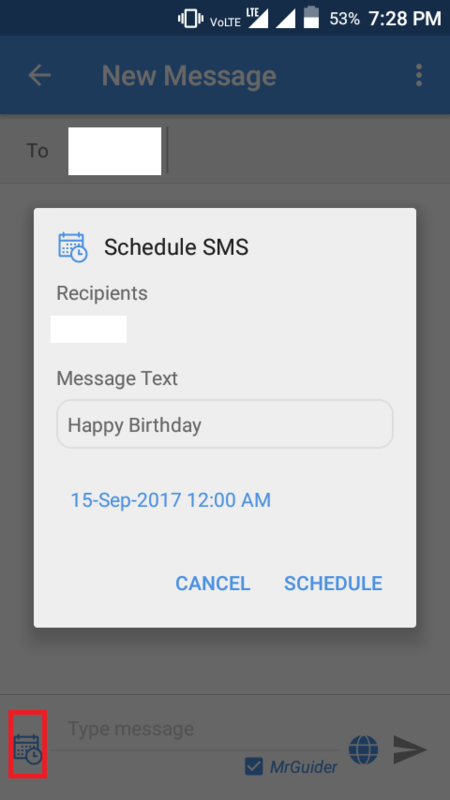 Now, You Can Schedule SMS With SMS Organizer. For Example- You Want To Wish Your Friends, Relatives Happy Birthday At 12:00 AM Or Send Wishes On Occasions Etc. 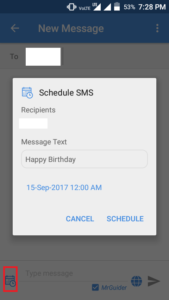 With SMS Scheduling Feature You Just Have To Select A Contact Number, Tap Schedule Icon(See Picture Above-Red Area) Type Your Message And Set The Time And Date. On Set Date And Time, SMS Organizer App Automatically Send Your SMS To That Person. It’s Too Useful!! Another Feature Which Is Added Is Of “Message Signature”. If You Ever Tried Gmail’s Signature Then You Know What Is It. Message Signature Let Users Add A Particular Name At The End Of Each Message You Send. This Is Helpful For Those Who Owns A Shop. One Can Add Their Brand Name Or Shop Name With Message Signature. Go To SMS Organizer Settings, Scroll Down To Bottom. 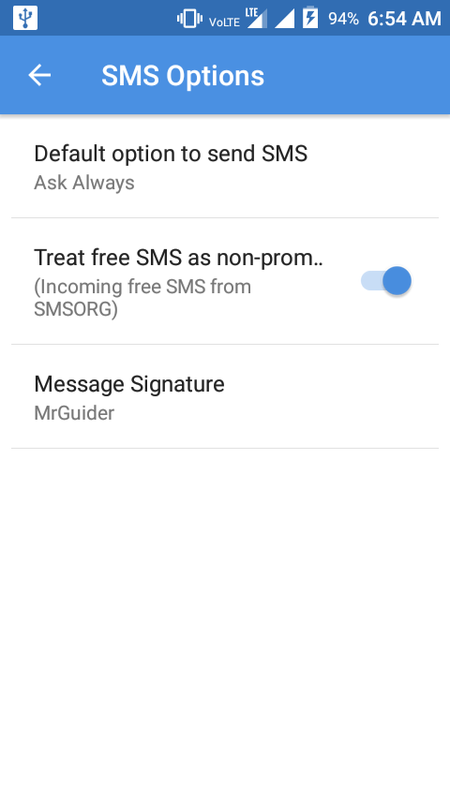 Open “SMS Options” Then Click On Message Signature. Add A Name. That’s It. Every Time When You Send A Message To A Person, Message Signature Will Auto Add To The End Of Message. With Rules Feature You Can Delete Unnecessary Messages After A Certain Time Of Period. For Example- Many Time You Got OTP Messages, Almost Every OTP Messages Codes Valid For Up To 1 Hour Or Less. So, With SMS Organizer App You Can Set Rule To Delete OTP Messages After 3 Days Or More. Similarly, You Can Delete Older Promotional Messages Also. Microsoft’s SMS App Comes With Google Drive Back Up And Restore Integration Support. Means You’ll Be Able To Auto Back Up Your SMS To Your Drive And Restore Them Later. When You Receive A Message, SMS Organizer App Automatically Detect What Type Of This Is? Like Personal, Individual Or Transactional. And Sort It Between Three Sections. 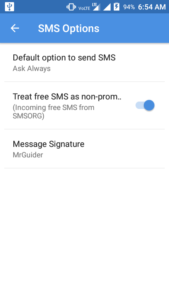 With SMS Organizer, You’ll Get Daily 30 SMS For Free, Internet Connection Is Required For You, But Recipient Don’t Need The Internet. However, This SMS App Is Limited To India. Microsoft Should Launch This App Is U.S. Also Because Many Indians Don’t Use SMS Service As They Already Get Cheap Data Plans From Service Provider. But In U.S. Many Users Use SMS To Chat, Group Chat.